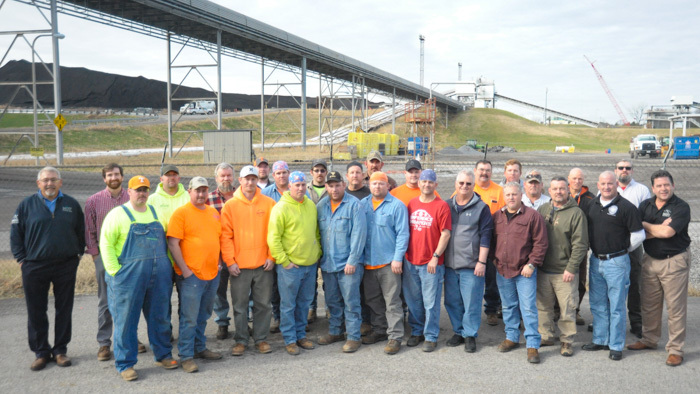 NINETEEN MEMBERS FROM seven locals received paid time off for Boilermaker Code training at the Gallatin Fossil Plant in Sumner County, Tennessee, December 13. Chattanooga Boiler’s senior vice president of operations, Myron Richardson, welcomed members to the training. Teaching the class were Jay Brophy, MOST mobilization and training rep and Ray Parrott, MOST Boilermaker Code trainer. Also attending were Chris Rose, Chattanooga Boiler’s assistant construction manager; AD-NTD Shon Almond; IR Monte Causey; Local 455 (Muscle Shoals, Alabama), BM-ST Tres Howard and D-NTD Mike West. Completing the training were, from Local 45 (Richmond, Virginia), Wesley S. Cale, Jr; Local 105 (Piketon, Ohio), Steven R. Cremeans; Local 433 (Tampa, Florida), Jarrod Langford; Local 454 (Chattanooga, Tennessee), Bobby Bishop, Steve Bishop, Danny Davis, Kevin E. Howe, Nick Kile, Chris Owens, Jason Smith, Chad E. Walker and Josh Wampler; Local 455, Michael Roberts; Local 456 (Rock Hill, South Carolina) Daryl W. Dixon and Ethan Ormsby; and Local 592 (Tulsa, Oklahoma) Nathan Gilmore, Kenneth Hastings, Brandon Mitchell and Jackie Morris.